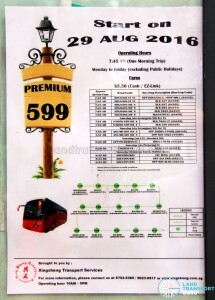 Premium Bus Service 599 is a Premium service operated by Xing Sheng Transport Services from Hougang Street 51 to Shenton Way. 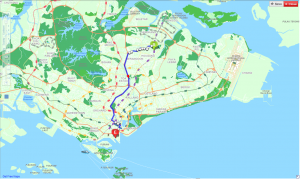 The route passes through Serangoon North Ave 4, Ang Mo Kio Ave 3, Telok Ayer and Fullerton, operating one trip in the morning. 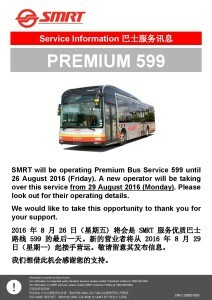 Xing Sheng Transport Services took over operations of Premium Bus Service 599 from SMRT Buses on 29 Aug 2016. 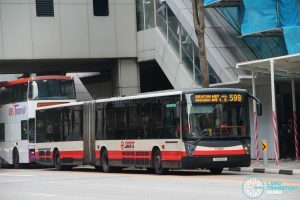 Premium 599 serves the housing estates of Hougang Neighborhoods 5, 6 and 9 and Serangoon Neighborhood 5 with bus connections to Telok Ayer and Shenton Way, eliminating the hassle of transferring between different modes of transport. The steep fares and cheaper alternatives make Premium 599 a more expensive alternative route to the city, but passengers get to enjoy the luxury benefits of Premium travel. This service shares part of its catchment with Premium 574, also heading to Shenton Way, which charges $4.00 per trip. One trip is operated in the mornings, departing Hougang Street 51 (Opp Hougang Green Shopping Mall) at 7:45am on weekdays. Operating Days: Weekdays only. Does not operate on Saturdays, Sundays and Public Holidays. Fare: Flat fare of $5.50. Transfer rebates & concessionary travel are not applicable..
Fleet: Premium 599 operates on Private Buses under Xing Sheng Transport Services. 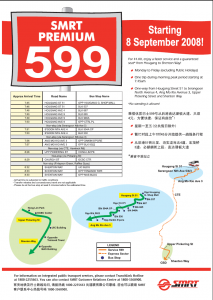 2008 (08 Sep): Introduced as a Premium Service from Hougang Street 51 → Shenton Way. Charges a flat fare of $4.00. One trip departing at 0745hrs.